"Cheap" and "affordable" aren't so different from each other. They both suggest saving money, so why are we making a big deal about the difference? To start, we'd like to double down on the "shady, half-arsed" connotation of the word "cheap." "Cheap" should bring to mind the image of a used car salesman with a combover and greasy mustache. That's the equivalent of what you'll get when you search for cheap SEO. "Affordable," on the other hand, implies low cost, but you retain a measure of quality. 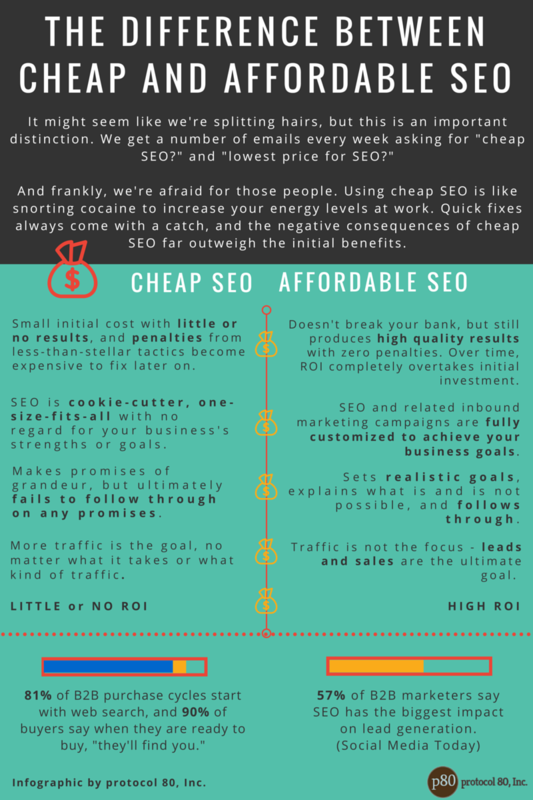 SEO can be affordable - high quality, no penalties, and the ROI will return what you initially invest (plus a lot more). "Cheap" SEO may cost less short term, but it will also bring less revenue and fewer profits in the long run. It can also bring penalties and harsh consequences if the agency you choose uses shady tactics. As a business owner, you need to think about long term payouts over short term savings. Let's break it down. 81% of B2B purchase cycles start with web search, and 90% of buyers say when they are ready to buy, "they'll find you." 57% of marketers say SEO has the biggest impact on lead generation. There you have it. It pays to educate yourself about the benefits of great, affordable SEO - you'll end up with higher profits, more brand awareness, and happier potential customers. And, as always, make sure to thoroughly research any SEO company before hiring them, no matter how many pretty promises they make. Your website and your business are too important to put in the wrong hands.